When and how did you first get into music? Was there music before there were monsters? When I was two years old I was crawling up on the piano bench and picking out melodies I'd heard. By the age of five I could play popular songs. My Mother was First Cellist (on staff) with NBC Radio and the San Francisco Symphony Orchestra, and my Father played violin. My Uncle on my Mother's side was Red Nichols (Red Nichols & the Five Pennies jazz band), so yes, the music was first. I had a babysitter - Raquel Lopez was her name - and she used to model things in clay for me. I remember asking her to model a phonograph record, and she did, with little grooves and a label (I requested “Tea for Two”) sculpted into the soft oil-base clay, and I was very disappointed because when I went to play it on my little phonograph, the needle just sank into the gooey clay. I was two or three at the time, so into art but not very bright. My Guiding Lights were my devoted Mother and Father, Uncle Red, and Dawn (she guides me still). My list of mentors includes Milt Larsen, his brother Bill, Thomas Ryan, Don Post, Korla Pandit, Mae West, Jim Warren, John Chambers, John F. "Bud" Sweeney, Stan and Donna Freberg, then just about everyone else I have ever known in my lifetime. Each has contributed something to my essence, teachers and friends alike, and I would surely be less without each and every one of them. When I was ten years of age I studied classical piano with Thomas Ryan who at the time was Head of the Music Department at San Jose State College (now San Jose State University); he was a brilliant pianist, plus he was an avid Charles Addams devotee, and introduced me to Addams’ great cartoons in the esoteric New Yorker magazine. I have all the Charles Addams books, including “Drawn & Quartered” and “Family Album!" How important a role does music play in your life today? Music always has meant the world to me. I couldn't live without it. I think I'm 99% music and 1% water! And I'm very proud of my albums - The Phantom of the Organ and The Vampyre at the Harpsichord - spooky old pipe organ and death- rattling harpsichord, Circus Clown Calliope! Vols. 1 & 2, (on Electric Lemon Records), and Key of Sea, Forever, In Time, and Candlelight... (New Age Grand Piano on Dejavu Records), recorded at Capitol Records' studios, located in the Capitol Tower at 1750 North Vine Street in Hollywood, CA, on Nat “King” Cole's Steinway Grand. How did the monster albums come to be? The Phantom of the Organ, Vampyre at the Harpsi-chord, and the others? Milt Larsen of Magic Castle fame and I were sitting at the downstairs bar of the Castle one night in 1972 enjoying a booze, and lamenting the fact that Decca/Universal pulled the Karloff album we created and produced (“An Evening with Boris Karloff & His Friends”) off the market. When the Lugosis filed their lawsuit against Universal, Dracula masks and Lugosi voices on soundtracks and other Bela-related merchandise was pulled off the market by Universal immediately. Don Post Studios received a letter from Universal instructing us to “cease and desist“ from making the mask. I guess Universal sent Decca the same letter, which - now that I think about it - seems unnecessarily repetitive. Nevertheless, Milt and I felt, then as now, that "An Evening with Boris Karloff & His Friends" is an all-time Classic. The script by Forrest J Ackerman was just outstanding, and Frank Bresee’s editing was excellent. Charles “Bud” Dant Executive-produced for Decca Records, Bill Loose composed the transitional music and conducted the orchestra, and all of this on an album of original “terror film” voice-tracks hosted by The King himself! A monster lover’s dream-come-true (actually, another one of my dreams realized). I came up with the idea of putting those voice tracks on record, but it was Milt Larsen who suggested Boris Karloff as “host." A stroke of genius, and to know (as I well-do) of Milt’s many talents and accomplishments is to realize he IS, most truly, a genuine Genius. Arthur Kennard, my long-time Friend and agent, who also represented Boris for years, recently presented me with the original copy of the “Friends” contract with the signatures of Boris, Milt Larsen, and me on it! Anyway, Milt Larsen and I had tried to buy our album back from Decca several times, but they weren’t interested in selling our album back to us. So, Milt came up with the idea of doing our own spooky album that night as we sat at the bar, quaffing our cocktails. He knew of my pipe organ work because we had recorded some pipe organ atmospheric background music for the Castle’s “Houdini Séance," so Milt believed I was the phantom for the organ. We booked an hour and went back to our séance organ studio, Whitney Studios in Glendale, where years before Walt Disney and organist Loren Whitney had built a recording studio around a massive 4-manual, 34-ranks-of-pipes Wurli-Morton, and I played six compositions of my own - very heavy, ponderous, depressing themes suitable as background for embalming, interment, or simple mayhem - while Whitney recording engineer Paul Elmore kept the tape machine rolling. 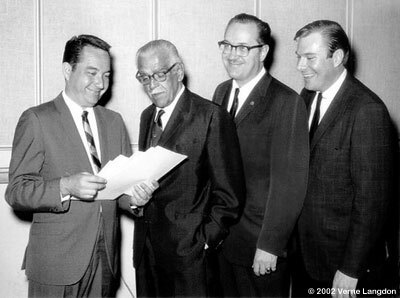 My partner and Executive Producer Milt Larsen leaned back in the Executive Producer’s chair, and adroitly directed the session. When the album was released, reviewers like The Cleveland Plain Dealer’s celebrated Emerson Batdorff gave it rave reviews, and Erik has been playing his organ in people’s homes and amusement parks on Halloween and on cable and network television shows like “Good Times," “All My Children,” and “Port Charles” ever since. After “Phantom” was released, we were inundated with requests for “more spooky music," so we followed up with “Vampyre at the Harpsichord." Both these albums were sold at Disneyland and Disney World for many years, as well as magic and novelty shops, and even some costume and Halloween shops, along with our “Music for Magicians," “Haunted Séance," “John Carradine - Poe with Pipes," and “Circus Clown Calliope! Vols 1&2," all of which I composed and played on (plus a few others), for ELECTRIC LEMON RECORDS ( “We Make Music for FUN!!!”). As for the "New Age" soothing piano recordings for DEJAVU, the first CD, "Key of Sea," was "Magic Milt" Larsen's concept; grand piano and sounds of the sea, gently combined. That album led to "Forever, in Time" and "Candlelight" (Howard Stern has been known to use cuts from "Candlelight" underneath his "Very Special" intimate interview segments). How did you arrive at wrestling and Slammers? As far back as I can remember, I loved to wrestle. So did my Dad. I think I came by it naturally, like the music. Big guys from the ring like prizefighters Max and Buddy Baer were around our house a lot when I was growing up (my Dad made their protective mouthpieces); they'd play football with me... using me for the football. I wrestled with my cousins (they were older, and bigger, so I really had to work hard to beat them!). I always had it in my mind to get a place and set up a ring, which is what I did back in '89. Almost everyone we trained is wrestling professionally somewhere - most in vest-pocket federations, although Ed Ferrara (our “Beautiful Bruce Beaudine”) was one of our students, and he went to work for the WWF and later WCW. But now he's out in the independent field. At one time or another Slammers has been featured on all the networks, CNN, Fox News, E! Channel, The Learning Channel, in specials about Professional wrestling and the WWF, and was even mentioned in Time Magazine! We also did a TV pilot for a WB Network series, produced seventeen wrestling videos, brought pro wrestling back to Strongbow Stadium in Bakersfield, California on a weekly basis, and those were our wrestlers ("Movie Star Mike" vs. Joe Kimball) going at it in the ring during the opening moments of the Tor Johnson scene filmed at the Olympic Auditorium in Tim Burton's "Ed Wood!" I'm very proud of what we accomplished with Slammers Wrestling Gym, "Slam U," our full pro wrestling museum (the very first of its kind anywhere), and wrestling archives, and our Slammers Wrestling Federation. One of our top instructors and a very dear Friend, with whom I’ve had some very tough matches, El Toro Bravo, is the owner and Head Slammer now. What do you think about what the wrestling industry has become? Do you personally know any of the wrestlers from back in the day? Is there a chance I may have seen Verne Langdon himself in the ring? I’m from the old school of wrestling, and I have had the distinct pleasure of knowing a good number of the boys and girls, including Women’s World Champion for 30 years The Fabulous Moolah, Mae Young, the great World Champion Lou Thesz, Gorgeous George, The Torres Brothers - Enrique, Ramon & Alberto, Mike and Ben Sharpe (Mike built Slammers‘ ring), Vic & Ted Christy, “Iron Mike” Mazurki, Chuck Krauser, Karl Von Hess, The Intelligent, Sensational Destroyer, Terry Funk, and others. 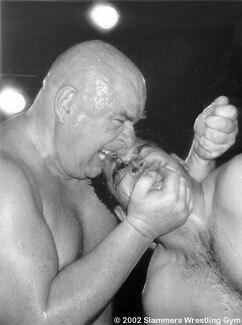 (Moolah and Tor Johnson “taught me the ropes”). Today professional wrestling is nothing like the “old school” - it’s streamlined, fast-food entertainment, and the language and situations are - in my humble opinion - completely over the top. Nonetheless, the sport is still very much alive, and will always exist in one form or another, for which I am eternally grateful. Nothing is more fun to view or do! As for seeing “Verne Langdon himself” in the ring, you can STILL see “himself” in the ring if you order any of the Slammers Wrestling Federation’s Ring Videos. One last question... If you could go back in time and retrieve something to bring back with you, what would that be? Doesn't necessarily have to be something tangible, could be something abstract. And it doesn't have to be monster-related. Well, I’m having a wonderful life, and it’s not winding down. Failing in the operation of a lemonade stand (I drank up all the profits) at age five, I was a "lot boy" washing cars at the age of twelve, and performing magic by the age of fourteen. When I was fifteen I was demonstrating organs and pianos for Sherman Clay & Co. and Ferguson Music House, the two largest music outlets in San Jose, performing in concert for both facilities, making masks and props at age sixteen, playing piano bar in clubs and performing as a personality on radio at the age of seventeen, developing Don Post Studios at age twenty-one, working at all the major film and television studios in Hollywood as a makeup artist, doing makeup and contributing gags for Chuck Barris and the Gong show, writing and producing for satirist & commercial mogul Stan Freberg, teaching clown makeup for Ringling Bros. and Barnum & Bailey Circus, writing, producing, directing, and composing The Land of a Thousand Faces and Castle Dracula shows for Universal Studios Tour with Jay Stein and Terry Winnick (plus a number of in-house projects at Universal, also with Jay Stein and Terry Winnick), writing songs (words & music), directing shows and producing albums (Boris Karloff & His Friends for Decca, and Electric Lemon Records) with my record partner Milt Larsen, producing an album and later a CD of Korla Pandit (Korla was one of my teachers; he and his wife Beryl became good Friends of mine. Dejavu Records maintains the Official Korla Pandit Website), performing three New Age albums for Dejavu Records, having my songs recorded by Kay Starr and April Stevens among others, being a member in good standing of ASCAP (American Society of Composers, Authors and Publishers), playing pipe organ accompaniment for silent movies like Chaney Sr.'s "Phantom" and "Hunchback" and the Sennett comedies with Harry Langdon (my Father's second cousin), Buster Keaton, and Charlie Chaplin, creating and operating Slammers Wrestling Gym, in addition to a whole bunch of other fun stuff, plus I know how to build the perfect Navy Grog, just the way Don the Beachcomber & Trader Vic used to make 'em! Immediately following the Northridge earthquake I moved out of Hollywood, north to Montecito near Santa Barbara, and I live here in a little pad on the beach, in total peace and tranquility. I'm not exactly sure what we'll do for an encore, but there are quite a few things I have in mind. And with God's Blessing, I can give every one of those things about five years, and still have time left over to "retire!" So far all my dreams have come true, I love where I am, spiritually, physically, and aesthetically, I live in the present, and I'm very much looking forward to what the future holds. But every now and then, I do what you are asking about: I go back in time, in my mind, and retrieve some of the very happiest memories my Family and Friends have made with me during each and every one of my years. And I put those memories away, one by one, for safekeeping, in my heart, where they continually warm my soul and will live on and on and on, throughout the Ages to come. Wow! Thank you for your time and for offering up so much great info! 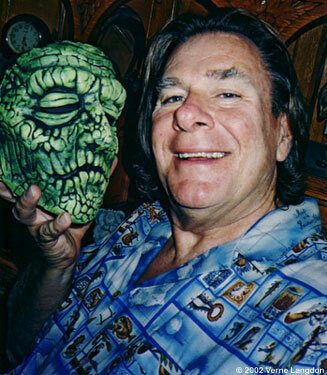 Thank you, Jimmy, for interviewing me, and my very best wishes to you and our fellow mask enthusiasts everywhere! Any and all visual material, including photographs, and interview replies of Verne Langdon contained herein, are, unless otherwise specified, © 2002 Verne Langdon, All Rights Reserved. This material is proprietary and all images and text are copyrighted and tendered for evaluation purposes only subject to the conditions that no copy, reproduction, including publishing, and no other means of reproducing or preserving or transmitting or recreating the images contained herein may be effected or reproduced, or stored in a retrieval system, or transmitted, in any form or by any means, electronic, mechanical, photocopying, recording or otherwise, without prior written permission of the copyright holder. A special thank you to Jimmy Doughty for this wonderful interview.